I have looked at a human tooth that was not human! 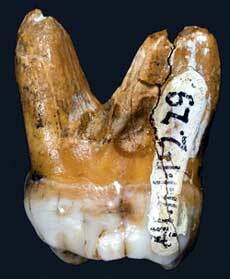 Can the tooth from the Denisova cave give us clues? Ancient bones found in the Denisova cave in Altai Krai in the southern part of Siberia have given us a new homo species: Denisova hominins. Our archaic cousin was genetically distinct from both Homo Sapiens and Homo Neanderthal but is believed to have interbred with both. A tooth found in the cave is the largest homo tooth ever found - can this be a clue to who the giants were? interbred, since the finger bone was found within 65 miles of Homo Sapiens and Homo Neanderthal sites. The mitochondrial DNA of the Denisova hominin suggests its ancestors left Africa around one million years ago but Prof. Dr. Svante Pääbo says it is possible that there are many other unknown hominin fossils waiting to be discovered. He says palaeontologists will continue to search for remnants in Siberia and other northern regions, where cold weather helps preserve ancient DNA. The only Denisova remains discovered so far are the finger bone, two teeth and a toe bone, - so it is difficult to say exactly how this homo species looked like. But the first tooth found is the largest homo tooth ever found; it was so large that the archaeologist at first mistook it for a cave bear tooth! The finger bone was unusually broad and robust, well outside what is seen in modern people. Some of the more interesting aspects of the find were the linkages between the extinct Denisovan and the people of Papua New Guinea in the Pacific; Denisovan DNA is in the genomes of the Melanesian people (and most probably also the aborigines of Australia) - on the other side of the world! The Russian archaeologist together with archaeologists from the Max Planck Institute also later discovered a tooth in the cave. They first thought it to be a molar of a cave bear but it soon became obvious that it was the tooth of a hominid. It was too large, however, to be from a modern man or Neanderthal. When the researchers finally succeeded in decoding the DNA of the tooth they found it to be similar to that of the finger bone; it hailed from a previously unknown early human species living in Asia at least 30.000 years ago; the Denisova hominin. - The fossil was found with modern technology and ornaments, including a very beautiful bracelet, one of the researchers said. The Denisova cave is located in Altai Krai, at the border of the Altai Republic of Russia in the southern part of Siberia. The cave is near the village of Chorny Anui about 150 km south of Barnaul, the nearest major city. It is approximately 28 m above the right bank of the Anuy River, has formed in upper Silurian limestone. It contains a central chamber with a floor of 9 x 11 meters, and has some side galleries. The cave sediments are rich with remnants of animals, including extinct ones. Altai Krai is a part of the Altai mountain system that covers a vast region spanning four countries: Russia, Kazakhstan, China and Mongolia. The highest and partly glaciated region lies in Russia and rises up to 4506m (Mt. Belukha) the highest point of Siberia. It extends southeast from there and merges into the high plateau of the Gobi Desert. Altai Krai has rolling foothills, grasslands, lakes, rivers, and mountains. The area has significant mineral reserves, included gold. In Turkic and Mongolic languages the name Altai means the "Golden Mountain". The Altai Krai area is part of a great crossroads in the ancient world. Nomadic tribes composed of different peoples crossed through the territory during periods of migration. It is mostly inhabited by Russians and by the local Altaians. The Altaians/Altay is a Turkic people, who were originally nomadic and date back at least to the 2nd millennium BC. The area is rich with remains from various ancient cultures and archaeological sites reveal that ancient humans lived here. The southern Siberia is also one of the richest regions in in megalithic sites, with huge stone walls, dolmen and menhirs, with legends telling of a disappeared civilization. In 1993 archaeologists found the mummified body of a young woman on Ukok Plateau, less than 200 kilometres away from the Denisova cave. She became known as the Princess of Altai, She died 2,500 years ago and the cause of her death and the tattoos she has is still shrouded a mystery. The brain and internal organs were removed, assumingly as a part of an ancient funeral ceremony. However, scientists managed to obtain DNA (haplogroup R1a), and it helped to reconstruct the ethnic history of the Pazyryks, who inhabited the Altai mountains during 5-3 centuries B.C. The Princess does not relate to any of the Asian races; She has a European appearance with blond hair and she is 170 centimetres tall (5 feet 6 inches). The tattoo covers the woman's both arms from her shoulders to her hands. A mythical animal is depicted on the left shoulder of the mummy - an antlered deer with the beak of a vulture. The Altai indigenous people say that the mummy is their progenitor and they call her Princess Kadyn (or Kydyn). They say that the tattoos conceal very important information for mankind but that the time to read the information has not come. They also believe that the woman was a priestess and that she passed away voluntarily to protect the Earth from evil spirits. Since 1929 archaeological excavations in the Altai Mountain region has uncovered a number of kurgans. These ancient contained extensive artefacts, including grave goods and several bodies known as Ice Mummies, which were superbly preserved the result of deliberate embalming and having lain in the frozen ground for almost 2500 years. Grave robbers have looted many of the valuable artefacts. One of the largest kurgans is Salbyk kurgan, to the east and less than 200 kilometers from the Denisova cave. Before excavations it was 25-30 meter in height and 500 meter in diameter. It was surrounded by standing stone statues called balbals, and was topped with a obelisk. It is considered that the Salbyk burial mound was created in the 4th century B.C. for a distinguished tsar-warrior burying. As far as I know: No giant mummies have been found in any kurgan in the southern Siberia. The Ice Princess with her 170 centimetre was very tall for a young woman at the time. An ice mummy man is mentioned as being very powerfully built almost like a Cro-Magnon homo, while others are described as much more slender. of ancient human remains and should be raising some questions! There have been found tall old, skeletons in kurgans not too far away - like in the woman in a kurgan of the neighbouring country of Azerbaijan. One skeleton is on display for the general public and the plaque says: "Kurgan. Woman funeral. The Bronze Age 2000 BC. The hight of woman buried in kurgan is 2m20centimetre. Near there are personal plates and folding for hair". Also to the west in Siberia, close to the Don river, at the major trading routes of the old world, there has been found a large skeleton of a man in a kurgan. He was 2 meter and 10 centimetres tall, estimated to be 2.4 thousand years old. An interesting that the man was trepanned - somebody had performed surgery on his skull! Tall mummies have also been found in the Gobi desert area, the extension of the Altai Mountains, called the Tarim mummies. Excavations in the Tarim Basin in Xinjiang province of western China have uncovered more than 100 naturally mummified corpses, preserved by the arid climate; People who lived there between 4,000 and 2,400 years ago. Some of them were 2 meters tall, or even taller, and they were so European looking that the Chinese government for many years kept the mummies a secret. But is no longer a secret that a Caucasian race with blond and red hair and blue eyes lived in the area and DNA testing data shows that the mummies had a Haplogroup R1a (Y-DNA) characteristic of western Eurasia in the area of East-Central Europe, Central Asia and Indus Valley. If we go to the west from the Gobi-desert, we will eventually come to republic of Georgia. We have in three articles seen that there have been found bones of an ancient giant near Borjomi in Georgia estimated to be 2.50 to 3 meters tall in a remote area of a natural park at the feet of the Caucasus Mountains. 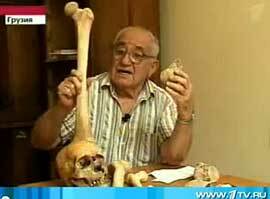 The renowned professor Abesalom Vekua believes that the find is a sensation, and in the news story on the Russian Channel One he shows the bones and confirms that they it differs from the bones of modern man in size and thickness: "They are mentioned as giants in the scientific literature, although this hypothesis was not confirmed". At many of the kurgans there is a kind of stone statues called balbals or kurgan stelae. The meaning of "balbal" is supposedly from a Turkic word meaning "ancestor" or "grandfather", or the from Mongolic word "barimal" which means "handmade statue". They might be on top of the kurgan, placed around it or in a double line extending form a kurgan. These stelae are also described as "obelisks" or "statue menhirs" and the encyclopedias say that are found in large numbers in southern Siberia/Russia, Ukraine, Prussia, Mongolia and Central Asia. Such stelae are believed to be memorials to honour the dead. It was reported that when kurgan obelisks of the Kalmyks held a bowl it was to deposit a part of the ashes after the cremation of the deceased. The strange ting is that you will ancient stone statues looking the same all over the word, from Siberia to Easter Island! They are all holding their hands on the stomach, sometimes holding something in their hands, sometimes not. Often very crude stone statues that are said by the scientific world to depict a deceased person, like a chief or a famous warrior. But the legends might tell a different story; that they are very tall, white skinned people that came from across the ocean in very ancient times - after a world wide catastrophe. Or that they are gods that came from the stars. Or the children that the gods or their sons begot with the women of the earth. Why are they looking so simular? Why are they holding the hands on their stomachs? What are they holding in their hands? Why do the hands on such ancient statues or stelaes sometimes have six fingers? Why do the legends tell the same stories? All over the world? And just by chance..? No, we are not buying that - are we? usually called dolichocephaly and is said to be caused by genetic disorder. 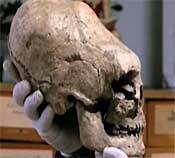 Well, elongated ancient skulls, very elongated, has been found all over the world, like Egypt, Iraq, Indonesia, Australia, Caucasus Mountains and the Pacific islands,- as well as South-, Central- and North America. It is said these elongated skulls are the result of the practice of head-binding (produced by binding the skull between two pieces of wood) to demonstrate social status like royal blood. But there are supposedly found ancient skulls that anthropologists suggest are elongated not by bindings, but belonging to an entirely different species only remotely similar to homo-genus. And some even claim that the skulls are not human at all: It has been found crystal skulls in the Himalayas with elongated skulls and the legends are that it pictures aliens from the star constellation of Sirius that came down to earth in a distant past! Also, quite close to the Denisova cave in Altai Krai it has been found an elongated skull - south of the city of Omsk a few hundred kilometers away. Igor Skandakov, the director of the Omsk Museum of History and Culture said: ''There are myths about gods who descended from the heavens and who had elongated heads. They were very special and were revered.'' But most scientists do not accept this idea, and are certain that such deformation was carried out either as a status symbol of belonging to the elite of society, or perhaps as a way to enhance the functioning of one's brain. ''It's possible that somehow they were able to develop exceptional brain capabilities,'' said archeologist Alexei Matveyev. "The bracelet demonstrates a high level of technological skills"
clubs? Might be in the same cave thirty thousand years ago? Yes, age estimates have been carried out using various relative and absolute dating techniques, and the bracelet is ca 30.000 years old. It was delicately shaped, highly polished and has a less that 8 mm wide hole drilled with a tapered drill that the scientists say must have been running with considerable speed! Giants or not - who were they? So archaic humans, Neanderthals and Denisovians shared the same area in Siberia 30.000 years ago but it suddenly seems that we were the dumbest in the class! We do not know if the Denisovians had the largest brains or were extremely tall but it seems that they had a technology far, far ahead of the time. So giants or not - who were they? 50,000 year old tiara made of woolly mammoth ivory found in world famous Denisova Cave. "Extraordinary tiara made for a man found in the Denisovan layer of the Denisova Cave in the Altai Mountains of southern Siberia, reports the Siberian Times today. Archaeologists working at the now famous site of the Denisovans have made another incredible discovery. It is a fragment of a large tiara made from mammoth ivory thought to be around 50,000 years old. This makes it the oldest example of a tiara anywhere in the world. When found the ivory piece was flattened out, but soaking it allowed it to resume its original curved form. Its great size suggests it was worn by a male to keep hair from going in their eyes." Denisova - a.k.a. Abominable Snowman, Almas, Almasti, Bigfoot, Hibagon, Kikomba, Meh-Teh, Mo-Mo, Oh-mahs, Orang-Pendek, Raksha, Sasquatch, Skunk Ape, Tano Giant, Wookie, Yerin, Yeti, Yowi, etc. Enjoyed the article very much. Hope to see more in future. I believe these are the remains of the Nephilim! I expect that Denisovans will enter the taxonomic group of humans with the discovery of more physical remains. Despite the DNA evidence, we humans need to see to approve, and a great many experts must approve to classify. There were also find some microscopic-nanospirals in Ural, built of hightechmaterial, some 300.000 years old..
Come on with more, folks!